Corporate Events, Meetings, Presentations, Conventions, Trade Shows, Fundraisers, Auctions, Fashion Shows, Theme Events & Private Functions. Our team of professional AV Technicians will deliver, set and operate the technical equipment. 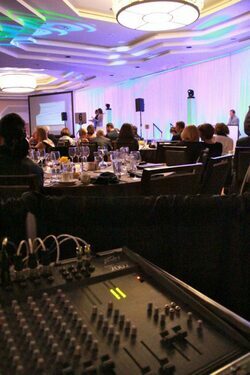 COLORADO EVENT PRODUCTIONS provides the best FULL SERVICE presentation and delivery of professional AV equipment. Our professional technicians provide our services with knowledge, confidence, a smile and, of course, we offer reasonable prices! We are known for our sound and work with many major corporations, local companies, non-profit organizations and more! Sounds of the Rockies Entertainment Group | COLORADO EVENT PRODUCTIONS provides professional AV Services, Presentation & Productions in Denver Metro, Northern Colorado, Front Range, Mountain Resort Towns, throughout the state of Colorado and Wyoming. Our team of professional AV Technicians will deliver, set and operate all of our audio, video and lighting equipment. Add In: Podium, Staging, Stage Lighting, Follow Spot and more! Do you need more services for your Meeting or Convention?